The incident (not pictured) happened less than 24 hours after getting the phone delivered from JD.com, victim Hui Renjie told Bloomberg Quint. It's said to have caused minor injuries to two of his fingers, and burned a MacBook. A Samsung represenative allegedly visited the man in person and asked to take the phone, but Hui refused, as he didn't trust Samsung to expose the reason for the fire. He's now trying to publicize the matter. In an email to Bloomberg, Samsung said it was "currently contacting the customer" and planning to "conduct a thorough examination of the device in question once we receive it." Although initial reviews of the Note 7 were positive, shortly after its August launch a growing number of customers encountered battery fires. The situation escalated to the point that Samsung ordered a sales halt and a global recall, with promises that new units would solve the fire threat. China was mostly excluded from the recall, as Samsung said that Note 7s sold there were already equipped with batteries that shouldn't overheat. 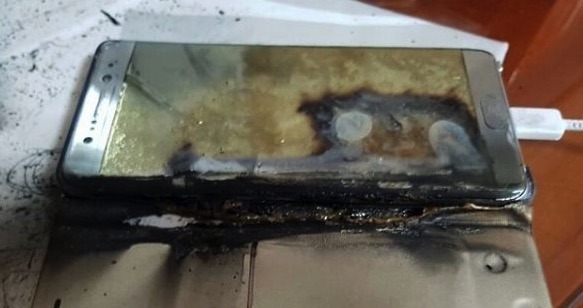 Two Chinese phones did catch on fire earlier this month, but Samsung claimed the units had been exposed to external heat and the batteries weren't to blame. The Note 7 recall is already expected to cost Samsung between $1 billion and $2 billion, and would only get more expensive if more units were included. Bloomberg recently claimed that Samsung rushed the phone to market to beat Apple's iPhone 7, working on rumors that the device wouldn't have any major upgrades. Samsung is said to have pushed suppliers into meeting tighter deadlines, despite also pursuing major feature advancements.